All students in the aforementioned grades received two books as gifts, from among a selection of several “feature titles” by Virgin Islands and Caribbean authors and illustrators. The students also receive tracking sheets, and a letter from the governor encouraging them to take the challenge and emphasizing the importance of reading. The 2017 Governor’s Summer Reading Challenge included our titles When I Grow Up by Rick S. Grant, Sea Turtles of the Virgin Islands by Mario Picayo, Spider in the Rain written and illustrated by Phillis Gershator and With Grace by Joanne Hillhouse with illustrations by Cherise Harris. 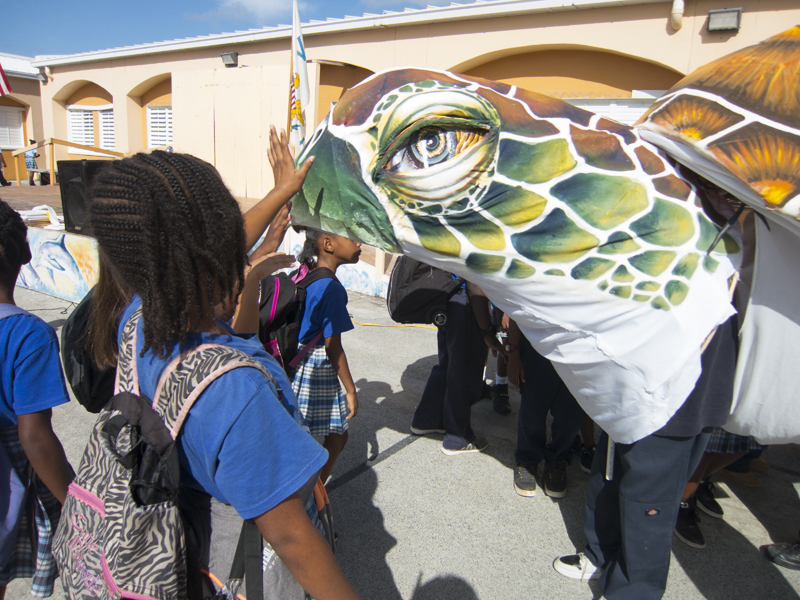 A giant sea turtle puppet, with moving eyes and flippers, made an appearance to the surprise and delight of children and adults. Little Bell Caribbean also assisted local authors Charlene Blake-Pemberton and Zayd Saleem in creating special editions of their books B is for Benye by and When the Trees Come Alive exclusively for the program.